WASHINGTON - The Supreme Court will allow President Donald Trump's partial ban on transgender people serving in the military to take effect while court challenges continue. Responding to Justice Department requests, the high court Tuesday cleared away lower court actions that blocked the controversial policy from being implemented for nearly a year. But the justices refused to hear the case before the Trump administration fights its way through federal appeals courts, which will leave the legal questions surrounding the action unresolved for now. The justices refused to hear the administration's appeal in the transgender troops case, which means lower court challenges can proceed. Four district court judges have blocked the policy, but a federal appeals court last week reversed one of those injunctions. Trump announced the policy in July 2017 with a tweet that said the government "will not accept or allow transgender individuals to serve in any capacity in the U.S. military." He was upset by the costs incurred by the Pentagon for troops transitioning from one gender to the other. "The Department of Defense's proposed policy is based on professional military judgment and will ensure that the U.S. armed forces remain the most lethal and combat-effective fighting force in the world," said Air Force Lt. Col. Carla Gleason, a Pentagon spokeswoman. Jennifer Levi of GLBTQ Legal Advocates & Defenders said the court's action "means that courageous transgender service members will face discharges while challenges to the ban go forward. 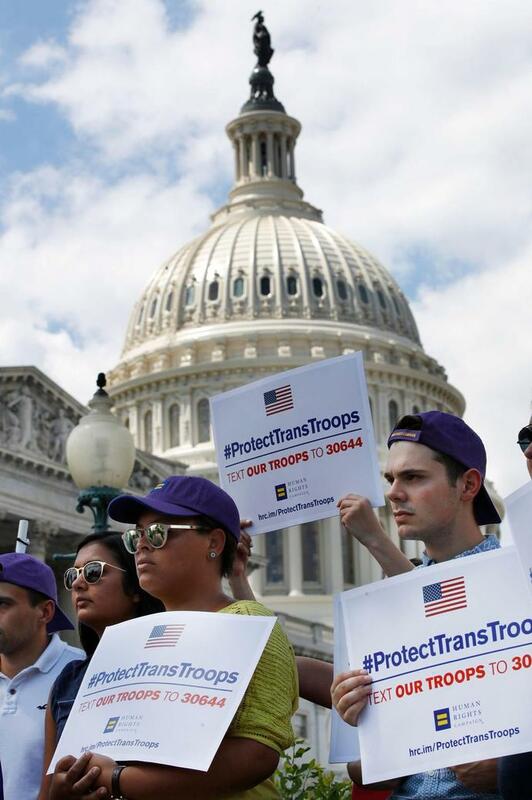 "The Trump administration's cruel obsession with ridding our military of dedicated and capable service members because they happen to be transgender defies reason and cannot survive legal review," Levi said.